FC Barcelona announced on Wednesday the financial reports that it will present at the Club’s Ordinary General Assembly on 21 October, when it will share the annual report with member delegates and seek their approval of the budget forecast and non-budgeted items. The Treasurer of the Board of Directors, Enric Tombas, detailed the Club’s financial reports from the 2016/17 fiscal year, which ended on 30 June with revenues of €708m. The FC Barcelona CEO, Òscar Grau, detailed the budget for the 2017/18 season, which forecasts revenues of €897m, a figure that will make Barça the world’s top earning sports club. It is a historic achievement for Barça and is in line with the Club’s Strategic Plan to reach €1bn in revenues by 2021. The forecast of €897m exceeds the €708m in revenues earned for the 2016/17 fiscal year which was published on 17 July following the approval of the Board of Directors. The profit forecast for the 2017/18 fiscal year is €21m after taxes, thus confirming the Club’s economic stability and sustainability. It will be the Club’s seventh straight year making a profit. In fact, since 2010, the sum of the Club’s annual profits totals €175m. This year’s budget forecast, which calls for a substantial jump thanks largely to non-recurring income, requires a continuing increase in recurring revenue similar to the growth experienced since 2010. 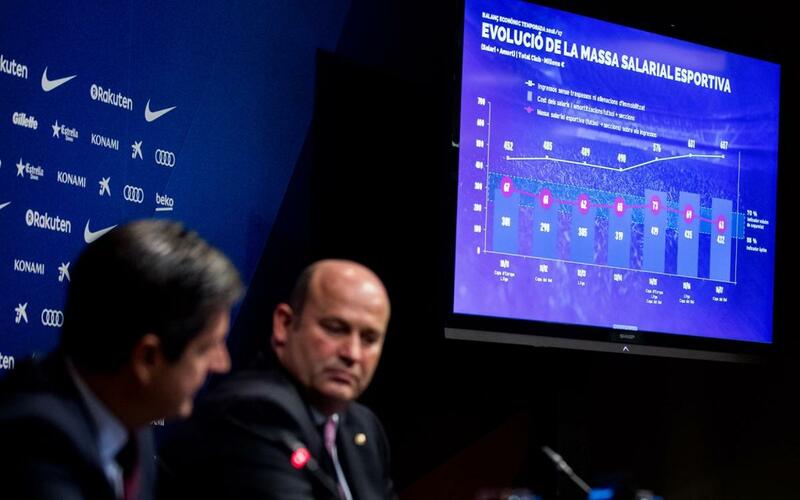 This important increase in revenues has led to an increase in the Club’s liquid assets and, thus, an improvement in the Club’s ability to invest and to strengthen the organization from a sports perspective. For the 2016/17 fiscal year, the Club achieved record revenues of €708m, bringing in €13m more than the €695m that were forecast. This was the first time that FC Barcelona surpassed the €700m barrier, and it was the Club’s fourth consecutive year of record income. The €708m in revenues is a 2% increase over what was forecast and a 4% increase (+€29m) compared to the €679m earned in the 2015/16 fiscal year. The €18.1m after-tax profit, however, was slightly lower than the €21m in profit that were forecast due to an increase in corporate taxes paid. In fact, the pre-tax profit was €31m, in line with what was forecast. With respect to the debt ratio established in the FC Barcelona Statutes, the Club’s debt fell by €24.5m to €247m. Since the beginning of the current mandate, the Club has reduced net debt by a total of €184m (not including non-recurring debt). The Club’s operating profit (EBITDA) ratio was 1.99, keeping it within the limit set forth in the Statutes, which for this year was set at 2.25.